CIRCA’s current research projects in the area of sea level rise are listed on the Sea Level Rise Projects & Products site. There you can find a description of ongoing projects and any products from the project, including tools, reports, data, presentations, etc. CIRCA works to enhance coastal resilience to sea level rise in Connecticut. Sea level change is caused by a number of factors summarized in the figure on the right (click to enlarge), but in recent decades ocean warming and ice sheet loss due to global warming have contributed significantly to global sea level rise. Along the east coast, including Connecticut, sea level rise rates are more rapid than the global average rate because of subsidence or sinking of the coastline. 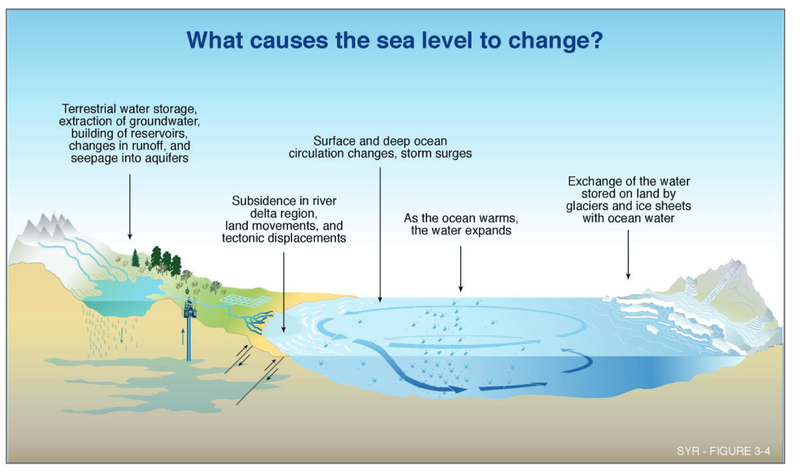 In 2012 NOAA released global sea level rise scenarios that were referenced in Connecticut state statute requiring that sea level rise be considered in state and local plans of conservation and development and natural hazard mitigation plans. That same statute charged UConn CIRCA with updating the scenarios to be local for the state of Connecticut. On October 19, 2017 CIRCA presented the local sea level rise scenarios in a public meeting. View materials from the public meeting and presentations. On March 27, 2018 CIRCA released a draft of the report and in October of 2018, a final report, Sea Level Rise in Connecticut was released. Sea level rise has multiple impacts on the Connecticut shoreline, including increased erosion rates, increased frequency of flooding, and coastal inundation. As sea levels rise the shoreline responds and beaches get eroded away and the coastline moves back. Other coastal features, like salt marshes, also migrate landward. With a relative higher sea level, a storm surge or high tide, that would not have been a problem in the past, now results in flooding. Inundation is the permanent drowning of our coastline. In the short-term the increase of 8 inches in sea level that we have already experienced since the mid-1800s is not as noticeable against the daily tides, however if sea level continues to rise at a rapid rate, the shoreline can expect to see somewhere between 1.9 and 6.6 feet of sea level rise by the end of the century based on the CIRCA local sea level rise projections. 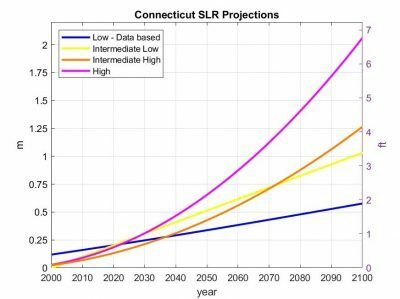 CIRCA's final report provides the basis for sea level rise projections in Governor's Bill S.B. 7, which was introduced into the 2018 legislative session and was enacted into law as Public Act 18-82. AN ACT CONCERNING CONNECTICUT’S ENERGY FUTURE. U.S. Department of Commerce. National Oceanic and Atmospheric Administration. Sea Level Rise and Nuisance Flood Frequency Changes around the United States, by William Sweet et al., Technical Report NOS CO-OPS 073, NOAA. Silver Spring, MD, 2014. “Summary of PA 13-179—sSB 1012: An Act Concerning The Permitting of Certain Coastal Structures By The Department of Energy and Environmental Protection” Last modified June 21, 2016. CIRCA local sea level rise projections: ODonnell 2017 Technical Report Executive Summary and Presentation (with audio) and slides only. 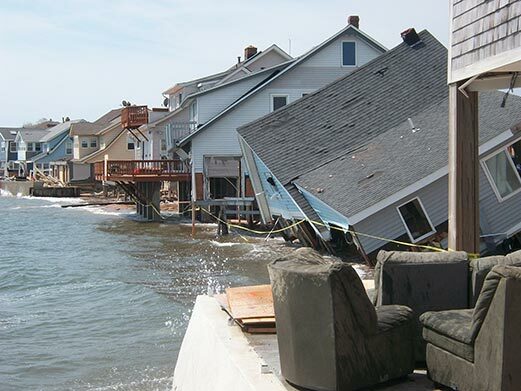 CIRCA's blog, "Current Policies on Sea Level Rise in Connecticut" provides an overview of PA 13-179 and the NOAA CPO-1 report's global sea level rise projections.